Rainwater seeps into the soil and builds up pressure against your foundation walls. This "hydrostatic pressure" can exert tons of force causing your basement to leak and crack. Hydrostatic pressure can press against your wet basement walls causing cracks or even buckling of the walls. Heavy, wet soil continually presses against your foundation walls. Saturated soil around your home in winter months can dramatically accelerate frost damage to your foundation. When water builds up in the soil around your home it creates pressure underneath your cellar floor. This pressure can exert enough force to cause your concrete floor to crack and leak. Many insects including termites and carpenter ants have a huge attraction to a wet basement. Leading pest control companies won't even guarantee their work until the leakage is repaired. Once insects find a comfortable home in your basement, they will likely infest other parts of your home. 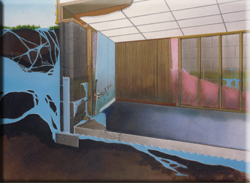 A wet, damp, leaky basement is the ideal environment for wood rot and property damage. Problems can be greatly aggravated by damp conditions in the basement. Water leakage can be dangerous. Water is a conductor of electricity. Moist, saturated carpeting or flooring combined with damp electrical circuits can be a dangerous formula. Moisture can also increase the risk of electrical arcing. Shock, electrocution and fire hazard can all result from a wet basement. A wet cellar can dramatically reduce the value of your home. Studies show that most people won't even consider buying a home with water leakage. Selling a home with water leaks can easily result in as much as a 25% reduction in the sale price. 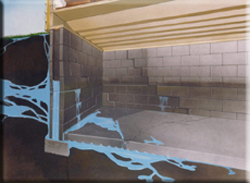 The B-Dry System is warranted for wet basement leakage for as long as you own your home. All content © 2006 Northeast PA B-Dry Basement Waterproofing Co., an Independent Licensee of B-Dry System, Inc, A DIVision of Penn State Waterproofing, Inc.
Warranty is backed and offered by Northeast PA B-Dry Basement Waterproofing Company. B-Dry and B-Dry System are registered trademarks of B-Dry System, Inc.
* Read actual warranty for all terms and conditions.